I love the option of the many colors and the variety of sizes available. I will purchase these shirts again in different colors as needed. And the price is fair in comparison to other locations and sellers! For customer service inquiries or to initiate a return, please contact Sunrise Outlet at questions at sales@sunriseoutlet.com or 877-751-0740. You can initiate a return for new and unopened items within 15 days of delivery for a refund. To qualify for a refund, items must be in new and unused condition with all original materials and/or accessories. If a return is not received at our processing facility within 30 days, it may be subject to a partial refund. You will be responsible for return shipping costs. However, if the return is a result of a fulfillment error, product defect, or damage incurred during shipping, we will refund the full cost of the merchandise. We will provide a pre-paid return shipping label for Non-Buyer's Remorse returns. All returns are subject to inspection, and if found not to be an error on our part, the return shipping costs will be withheld from your refund. SPECIAL RETURNS INSTRUCTIONS: The Seller charges a restocking fee of 20% that will be withheld from the refund. 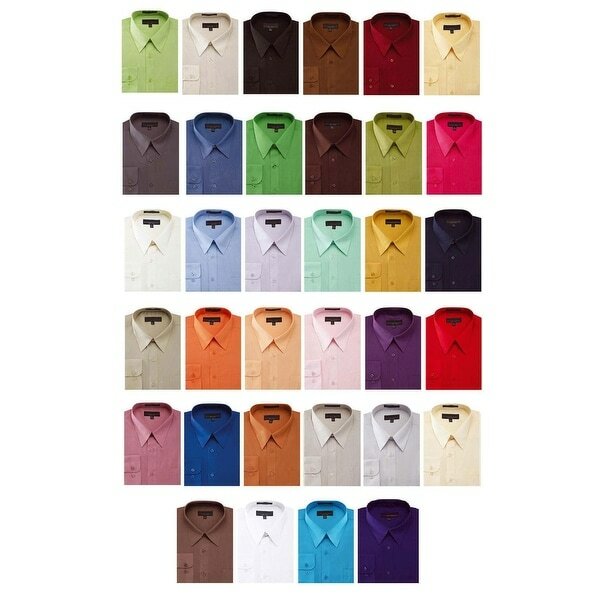 Solid color mens dress shirt. Made from a comfortable 35% cotton 65% polyester. Classic fit and traditional pointed collar. Button cuff with extra slit to convert to french cuff for cufflinks if needed. Available in many sizes and colors. I bought two of these shirts and I am impressed. They are as good of quality as the department store sell for $40 to $50. Fast shipping time, I got mine in 3 days. I have had both shirts cleaned and pressed twice now and color still looks new. I highly recommend these shirts. I Bought this as a gift. I purchased the lavender color and when I unpackaged it, it was very true to the color I chose online. The shirt is a nice weight and fits true to size. I ordered this shirt in mint color and although the shirt I got is a beautiful color I would not call it mint. It is much darker than what I would call mint. Does not go with the tie I had hoped it would look nice with. The material feels rather thin but for summer it will work well. Size seems right. Overall I am pleased with purchase. Collars are a bit large in width, but OK with the wearer who will only wear a tie to funerals. The selection of colors is quite pleasing especially the pink. Nice shirt. Wash and steam and it's ready to wear. I don't dry clean work shirts so the wash-ability is important. Fits true to size, I'd order again. This shirt also runs a bit small. Glad I had bought several otherwise I wouldn’t have had a shirt to go with suit for wedding. It was in the size and color I was looking for. Men's Dress Shirt Buying Guide from Overstock.com. Knowing how to buy dress shirts will help you achieve the professional look you want.